ARTBA’s Chief Economist Dr. Alison Premo Black, summarizes the report here. 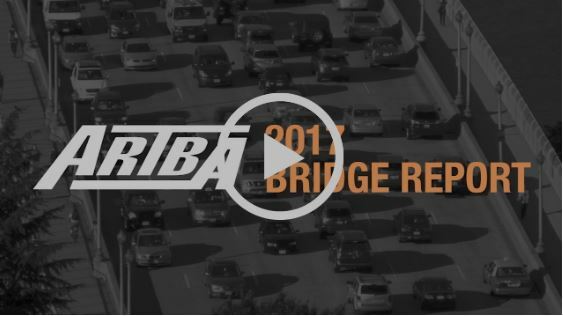 ARTBA’s 4th annual Bridge Conditions report landed with a big splash on Feb. 15 and has been making waves across the country ever since. It was mentioned in Jimmy Fallon’s opening monologue on The Tonight Show and major coverage has extended to FOX News, USA TODAY, The Washington Post, The Chicago Tribune, The Orlando Sentinel, Atlanta Journal Constitution, CNN, Reuters, D.C.’s top rated news talk radio station WTOP, National Public Radio, The Bond Buyer, and FOX, NBC and CBS television and radio affiliates across the nation, including Baltimore’s CBS station WJZ TV. ARTBA Chief Economist Dr. Alison Premo Black, who conducted the analysis, was also interviewed by NBC’s TODAY Show, which expects to air a story on Sat., Feb. 25. Not surprisingly, the media coverage has driven traffic to the www.artbabridgereport.org website. In the first 48 hours following the report’s release, the website had 55,200 page views and nearly 25,000 unique visitors, while more than 50 Twitter and Facebook posts have involved interaction with members of Congress, UPS, the U.S. Chamber of Commerce’s Americans for Transportation Mobility coalition, and many ARTBA-member companies. The report also reached the nation’s heartland. ARTBA’s state chapter affiliate, the Kansas Contractors Association, said the report was discussed by state legislators during a Feb. 14 appropriations subcommittee hearing. During the debate, State Senator Vicki Schmidt (R) asked why the same bridges are still structurally deficient for the past three years. Kansas lawmakers are considering an increase in the state gas tax.